I was recently given an opportunity to try out a My Magical Mermaid toy from Zuru. 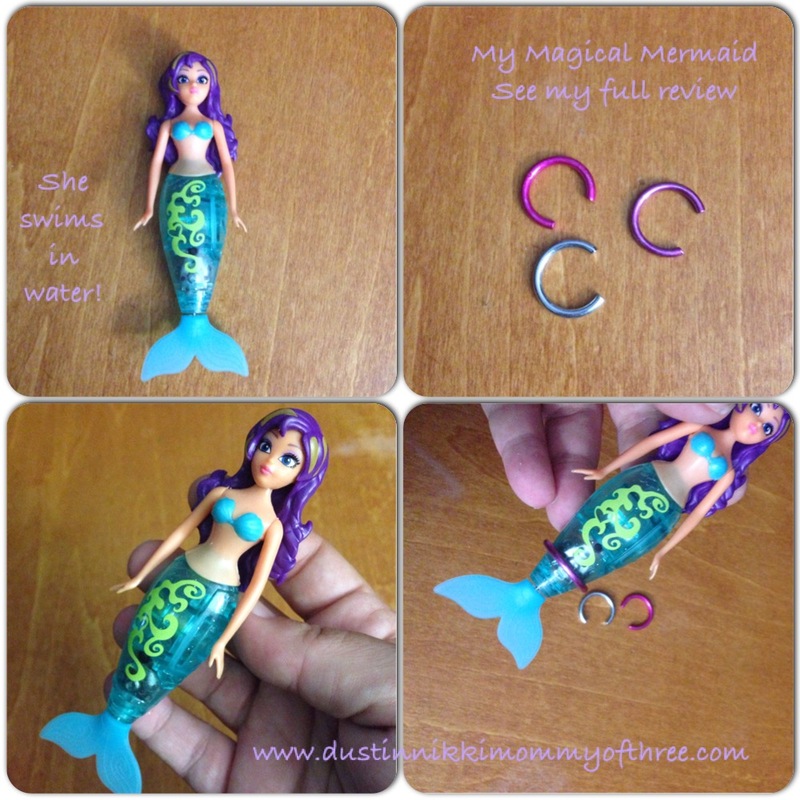 I was sent one of these adorable mermaids free for our use and review. The mermaid that we received is Pearl. There are others named Corissa and Shelly as well. 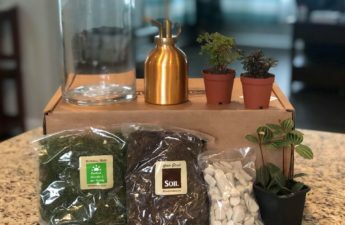 I was really excited to try one of these out because I know my daughter would love it – and she does. I’ll definitely have to get some more for her for Christmas. Pearl has purple and gold hair and her tail is blue and green. My daughter loves those colors together. The mermaid already has batteries installed and also comes with two additional batteries so you already have some on hand when you need to replace the batteries. I think that’s really awesome because the toy takes those little tiny batteries which can be expensive. It was pretty easy to take the toy out of the package which is another bonus for me. My Magical Mermaid comes with three weighted rings. All three of them have a different weight to them. The mermaid swims in water with or without the rings. Without the rings, she will swim on the surface of the water lying on her back. When you add a ring, she will become more vertical in the water and swim vertically instead of horizontally. While she is vertical, she dances and twirls in the water. Depending on how much water you have will determine which weight you will want to use. To watch her vertically, it’s best to have the Water Wonderland Playset which is a tube like container that holds water. That way the mermaid can be seen a lot easier. I do not have one of these playsets but I am planning on getting one. I let my daughter use one of my plastic mason jars in the meantime. Since I am planning on getting more of these, I was thinking about getting a small plastic aquarium so she can play with more than one at a time. Anyway, the weighted rings are really easy to put on the tail. They have an opening so it’s easy to fit them around the smallest part of the tail and slide it up passed the groove on the tail. The ring sits on the groove so it doesn’t just slide right off. I did notice that after a few minutes in the plastic mason jar, the ring would eventually fall off and my daughter would have to fish it out. I think this is because there wasn’t a whole lot of room in the jar because it only happened if the mermaid’s tail hit the side while she was dancing in the water. She does swim pretty well in water regardless of whether she is horizontal or vertical! The battery life seems to be pretty good. 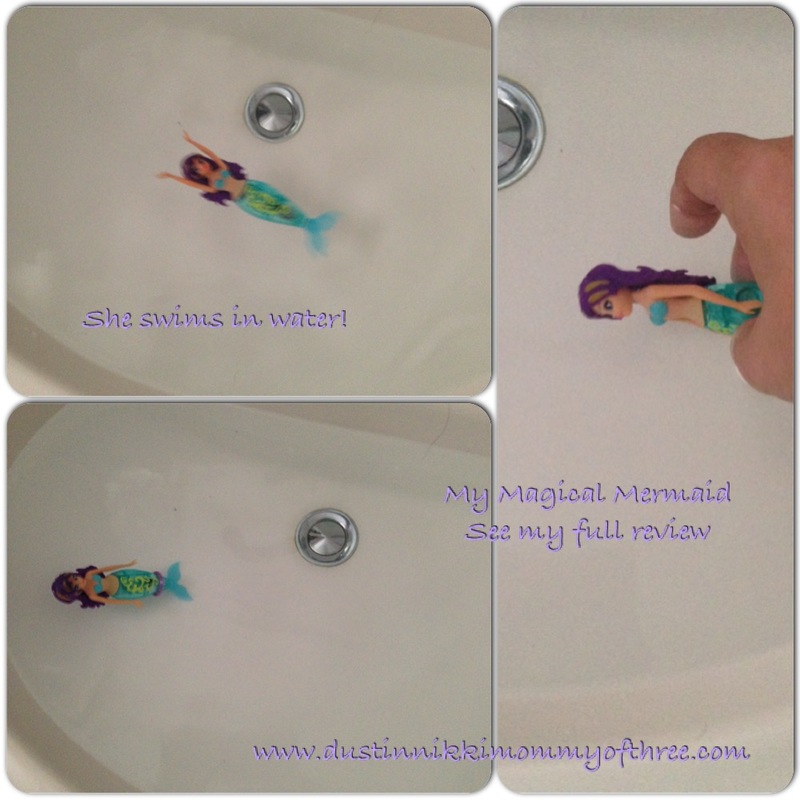 We have had our My Magical Mermaid for a couple weeks and our daughter has played with it quite a bit and our 5 year old son plays with it in the bathtub. I don’t think he cares that he’s a boy. He thinks it’s fun to play with. I’ll have to look into getting him some of those water activated fish by Zuru toys. He would get a kick out of those! As a parent, I think the My Magical Mermaid is pretty cool. It’s fun to play with and watch and my kids love it. Who knew something so simple would be so much fun?! Check out my video below if you want to see Pearl in action! 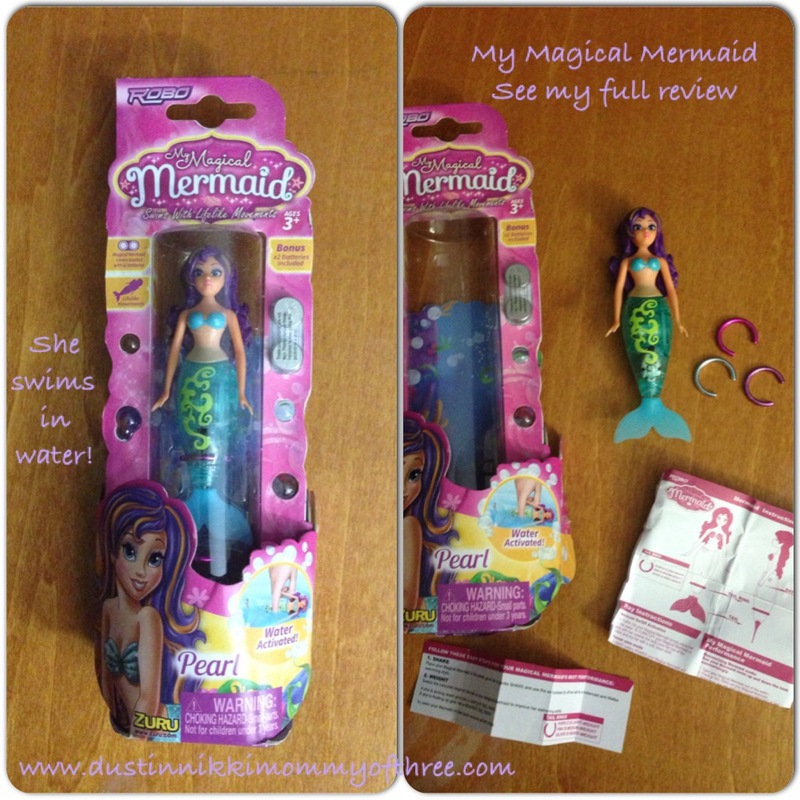 Where to buy: You can buy My Magical Mermaid at stores such as Walmart, ToysRUs, Kmart, and CVS for roughly $9 to $10 each. The playset is roughly $20 to $22. 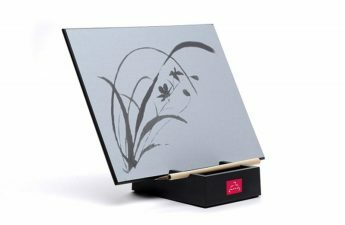 For more information, check out Zuru website. You can also find My Magical Mermaid on Facebook and you can also find My Magical Mermaid of Twitter. Disclaimer: I was not compensated for this post. 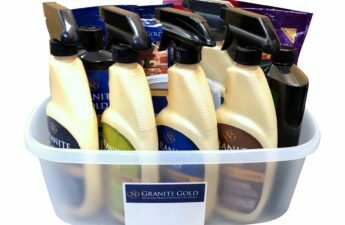 I received a My Magical Mermaid product mentioned in this post for free for my use and honest review. All opinions expressed in my review are 100% my own.